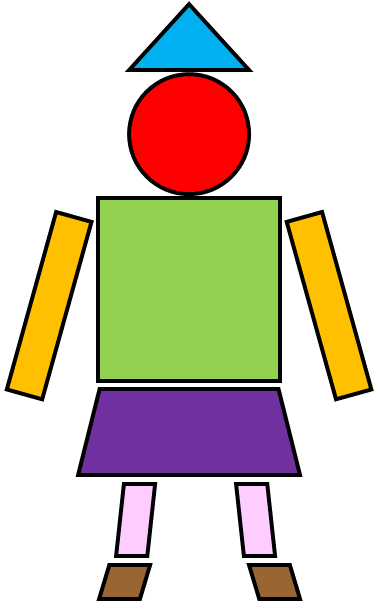 Name the polygons and other geometrical shapes that make up the Polygon People. This is level 1: basic shapes everyone should know. You can earn a trophy if you get at least 4 names correct. Level 1 - Basic shapes everyone should know. Level 2 - Geometrical shapes. Level 3 - Slightly more obscure geometrical shapes. Name the polygons and show the number of lines and order of rotational symmetry. Arrange the nine pieces of the puzzle on the grid to make the given polygon. Connect the names of the polygons with all of their properties. *Common quadrilaterals have special names such as square, rectangle, parallelogram, rhombus, trapezium and kite. Other shapes used in the people pictures are a circle and a semicircle. These shapes are not polygons because they do not have straight sides. Don't wait until you have finished the exercise before you click on the 'Check' button. Click it often as you work through the shapes to see if you are naming them correctly.